"It was hard. But good." Those are Navy Captain and ex-POW Charlie Plumb's words in regards to the trip he just took to Vietnam. And I got it; I was—for good, bad and indifferent—there with him. Ok. you should know that I am currently supervising the production of the next episode of my video show, "Old Guys and Their Airplanes." This next episode features Charlie's story, hence the production title, "There. And Back." We'll have a full Trailer ready in a few weeks but in the meantime, you can view five "Teasers" by clicking here. But for now, I'm sitting here, late at night, wondering just how we'll capture all the details of this incredible story. Progress shot, about 33% complete. ...this is my first Navy F-4; all the rest have been USAF versions. This bit of trivia is rather strange in that the F-4 is, in its heart, a naval aircraft. If you're like me, you think of the F-4 in its green and brown USAF "SEA" camouflage, bristling with bombs, missiles and fuel tanks. Yet, the F-4 began as a Navy plane and that means the typical gray paint scheme. 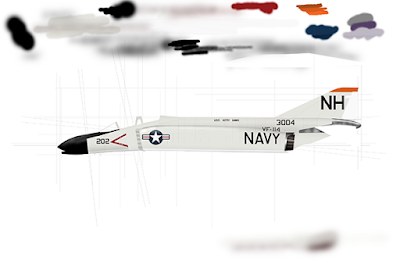 And the Navy also defined the F-4's original role as an "Interceptor" (as opposed to the aerial Swiss Army Knife that it would eventually become). Ok, this is where learning about the nuances of history really provides leverage for elevating one's brain. Did you ever hear the phrase, "No plan survives the first thirty seconds of combat"? On one hand, it's an amusing rejoinder. But on the other, it's prophetic warning. Birth, School, Work and Death are liberally sprinkled with examples of how one thing is intended but another prevails. Some people shrug their shoulders and accept Fate while others wonder, "Hmmm. What can we do to make this work?" Kind of like Charlie Plumb's morning aboard the USS Kitty Hawk on 19 May, 1967. His plan was to fly his 75th mission, return to the carrier and go home to wife and country. It didn't work out that way. that the North Vietnamese made out of woven bamboo/reeds in order to attract attacks. Charlie's F-4 was hit by a decidedly "real" SA-2. Nevertheless, think about this concept of "No plan survives..." for a second. Today, you're planning on going to work, the grocery store, work on the car...but tthe future' has another idea altogether. Designed by McDonnell-Douglas, the airplane was intended to counter the Soviet threat of bombers reaching the U.S. This is why they referred to it as an "Interceptor" —it intercepts. It's meant to climb fast, get to the target fast and do its job fast. Versus a commie bomber loaded with nukes, the traditional role of aerial gunfighting is a pure waste of time and energy. So, the F-4 was designed without a typical dogfighter's weapon, the gun. Tucked into elegant recesses under the fuselage, four ultra-high-tech Sparrow missiles were to be fired (from a distance) at whoever was stupid enough to start WWIII. The Interceptor job was a brilliant one for the Navy, too. Launched from carriers, F-4s could pick off any threat WAY before it reached the American continent. 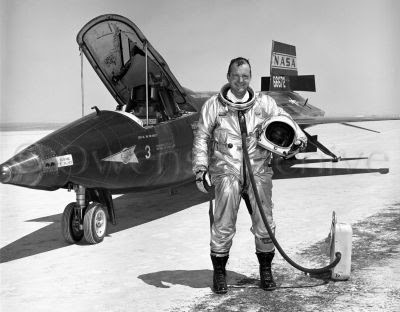 Charlie remembers "ground" training for future F-4 missions in a space suit connected to a portable air conditioner (see below). Yep, that's real Buck Rogers stuff. But it wasn't meant to be. We all know what happened next, right? Uh...yeah. "Vietnam," and with that, previously accepted strategy, tactics and tech were rewritten to accommodate what the designers of 1955 couldn't know. In the next ten years, the F-4 was adapted to carry a huge variety of bombs, more missiles and all kinds of electronic gizmos. Eventually, the USAF managed to stuff an actual dogfighting gun in the nose (the Navy refrained and maybe even wisely-so but that's another topic altogether). Nevertheless, it's interesting to note here that the Navy was extraordinarily successful with the F-4. According to one source, the USAF ended up with a 3:1 aerial victory ratio against the North Vietnamese Air Force. But the Navy managed a 6:1 ratio. And the Navy's figures are an average between the struggles of the war's early years and the later when new, adaptive tactics showed their worth. Now, I've done a fair amount of jumping around even for my patented ADD writing style. But I wanted to try establish the concept of "adaptability." The F-4 was intended for one thing and was forced to adapt to another. Charlie Plumb signed up for one thing (life aboard a carrier, flying jets) and was forced to adapt to another, too (six years in a torturous POW camp). I'll leave it like this for now: the whole trip came down to single picture that I took with my iPhone. In the meantime, have a look at the F-4B below. It's the airplane that Charlie and RIO "Gary" Anderson launched from the Kitty Hawk on 19 May, 1967. It was a day they never figured would happen and yet would forever alter the course of their lives. Stay tuned for more information on the next episode of Old Guys and Their Airplanes, "There. And Back." Finished. This is how Charlie asked for it - no tanks and with a sidewinder hung off each of the rails. To him, it's a reminder of his past. To me, it's a reminder of what can happen. Chances are REALLY good that you give no thought of how much your life revolves around the word, "Logistics." Bold statement, eh? And how do I know? Because I don't think about "Logistics" much either. Regardless, have a look at the airplane above. 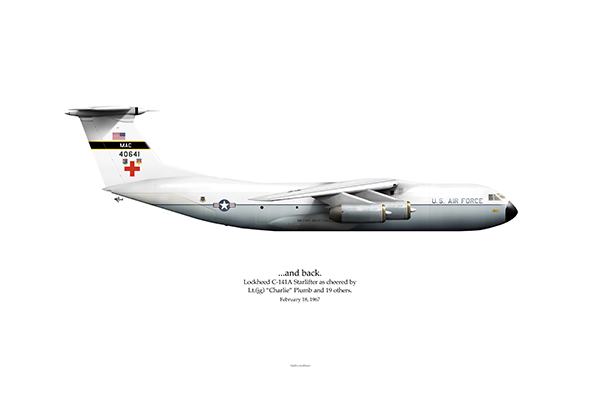 It's a Lockheed C-141A Starlifter. It's big, it's loud, but on an air show flight line, the "F" and "B" airplanes always seem to attract the bigger crowds. "C" planes are really just big pickup trucks. Right? I mean, what self-respecting 10 year old, staring up at the model airplanes hanging over their bed, wishes, "Some day, I'm going to fly Cargo planes." All that stuff in the grocery store? Food at the restaurant? Stuff at the store? Logistics—the practice of hauling stuff from point A to point B. Put another way, no cargo? No combat. Period. Let's take a moment, step back and prepare to appreciate the most important aspect of any force, Military or Civilian. And in this case, the C-141 is the Queen Mother. Designed in 1960, the C-141 was a response to what the military learned in WWII—the world was getting smaller and military activity depended on moving materiel over huge distances, quickly. We all have our opinions on whether or not the United States should have military presence in this country or that* but the reality is, if we don't want to fight HERE, we have to fight THERE. And "there" means moving a lot of gear. The C-47/DC-3 is largely regarded as one of, if not the, greatest aircraft ever built and there are solid reasons why. 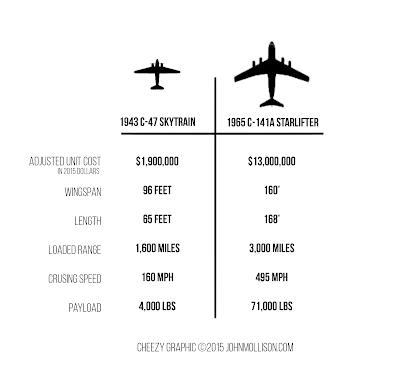 But in the military application, look at the numbers: The Starlifter had twice the range, three times the speed and nearly twenty times the payload. 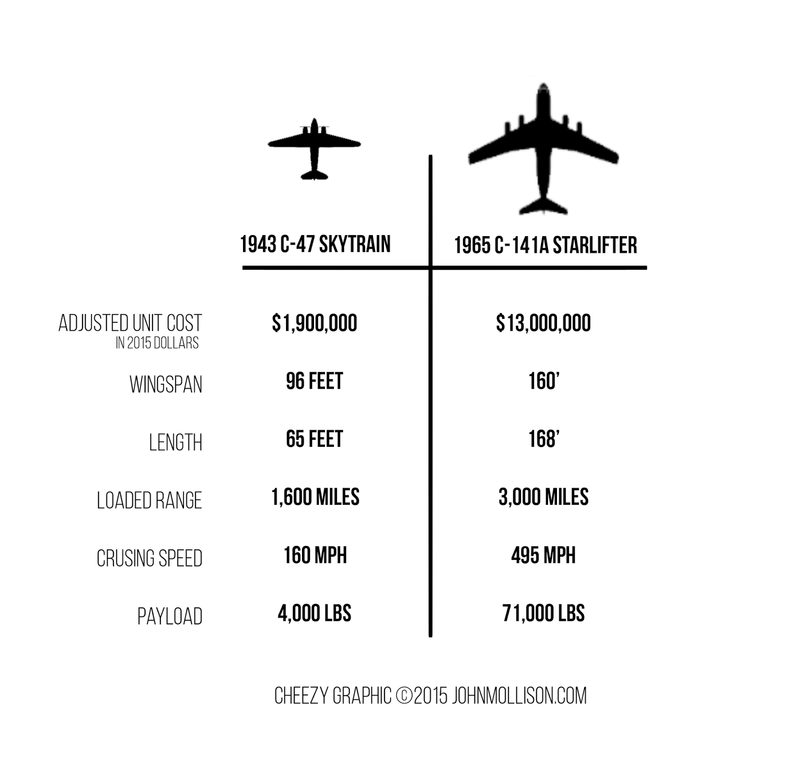 If you work out the ratio of cost/unit compared to hauling capacity, the C-141 crushes the C-47 by being three times as efficient. Go ahead, do the math...I'll wait. The C-141 was a simply amazing aircraft! For all the news coverage of government waste, I wish the average folk could realize that, for the most part, the engineers of American industry and the bean counters of Military Procurement do their best. And it's a pretty fine "best" too. Sad to say, the Starlifter is no longer moving stars. The last military flight occurred on 6 May, 2006. It was a pretty big deal and someone did a great job documenting it on YouTube (click here). But wait a bit before clicking on it, ok? There's more you should know. Today, the American airlift capability is practically spread out over three basic types - the C-5 Galaxy, the C-17 Globemaster III and the C-130 Hercules. I made another graphic so you can see the how the heavy-lifting is distributed. Somewhere between the ginormous C-5 Galaxy and the "jack of all trades" C-130 lies the former domain of the C-141. Today, the C-17 is doing the 141's job and from what I've read, even more efficiently. Logistics isn't always about "the numbers." Pulitzer Prize-winning photo, "Burst of Joy" by Slava Veder. You knew it was coming. "0641" was not just hauling stuff. This C-141 was one of 16 that ferried 592 American POWs from Hanoi to Clark, AFB during Operation Homecoming. Take another pause, ok? Think about what it would be like to have someone you hold dear taken away from you, held in uncertainty...and then returned. Forever changed. The process took almost a month and a half. C-141s would lumber into Hanoi's Gia Lam airport l and pick up the POWs as they were processed out of the infamous North Vietnamese prison system. Each C-141 would carry about 20 POWs. Of course, a Starlifter could carry many more than that, but Operation Homecoming wasn't a cattle car operation. Instead, it was a strange diplomatic maneuver that took a month and a half to work out. I bet it drove the C-141 crews crazy, too. Left to their own devices, they could have probably had them all home in 12 hours. 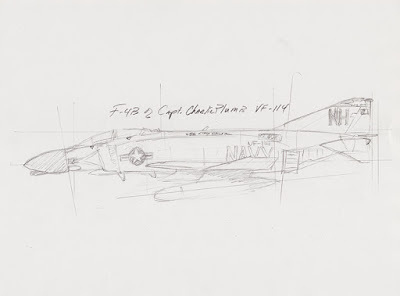 This all being stated, have a look at the drawing again—0641 is the very C-141 that flew into Hanoi's Gia Lam Airport on February 18, 1973 to return 20 POWs, one of which was then Lt. (jg) "Charlie" Plumb. Ok. The C-141 retirement video mentioned previously is really a fine piece that captures what the C-141 was all about. But before you do, watch the video below. The man shown is Charlie and the song is one written and performed by the POWs for President Nixon as an act of gratitude. (Special thanks go to the Plumb family for putting together this very cool clip). IMPORTANT NOTICE: Charlie signed a number of prints of my artwork featuring his F-4B Phantom and the C-141A Starlifter that carried him to freedom. 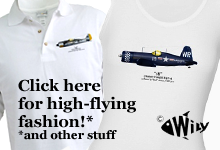 If you'd like to purchase one, proceeds are going to the Southern California Wing of the Commemorative Air Force. CLICK HERE. Profile 105: FINISHED—"SDANG" F-51 and Sliver Phantoms. Allow me a second to describe how I'm in business. Anyone can draw airplanes. To prove it, if we ever meet, I can teach you how to draw an F4F Wildcat in less than 5 minutes. And if you practice for a bit, you can probably give me serious competition. My airplane art is...(sigh) a commodity. BUT, as you might already know, the value in my artwork is that it is signed by the pilot who flew it in combat. That is not a commodity. The reasons 'why' I do this should be self-evident to you as a reader. For now, however, you might be interested to learn 'how.' In two words: digital printing. And, digital printing has been to the printing industry what digital cameras have been to the photography industry: transformational. Twenty years ago, I would have drawn my airplane with a pencil and colored it in with an airbrush or a colored pencil. This is actually a sweet and theraputic process that would have resulted in a physical drawing about 24 inches by 48 inches. Then, I would have hired a photographer—one that had a large-format camera, prior experience and an eye for the particular job—to take a picture of the artwork using especially high quality film. Once the film was developed, the negative would then be transfered onto "plates" that would correspond to varying degrees of Light Blue (Cyan), Pink (Magenta), Yellow and Black. These plates would then be used as "stencils" (sort of) that would apply the inks in such a way that the end result would be an optical illusion that would look like...well, one of my color drawings. 4-color separations kinda look like this. This is only a simulation but you get the idea. It's called a "4-color Process" and it's been the accepted way to reproduce color photography and artwork for a long time. ...from finished art to finished prints, the process took about two weeks. However using today's digital press, I simply walk into my printer's office, drop a USB-drive off with the pressman and later that afternoon, stop by for a press check that is almost always PERFECT. And a half hour later, I walk out with prints. 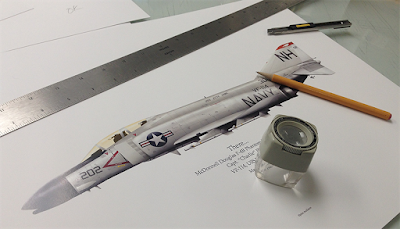 From finished art to finished prints, the process takes about two hours. When interviewing "old guys and drawing their airplanes," that time saving can mean the difference in getting the story and having it fly off into eternity without anyone being the wiser. Which kind of reminds me of that old phrase, "When an old man dies, a library burns." But that's a whole'nuther topic altogether. Anyways, my first limited edition print run was in 2003. A few months later, another edition was literally printed in the morning and on the plane to an interview with me that afternoon! Fantastic, eh? This is what a typical press-check scene looks like. On a normal 4-color press, this could take hours. With Xerox's digital press, it takes...like...two minutes. There are three reasons I have come to insist on Xerox's process: color accuracy, color consistency and a brilliant process that coats my image with clear 'varnish' to aid in the protection of the image. Well, Xerox caught wind of my loyalty and wondered if I would have any interest in a new development they have perfected: metallic ink. "Would I?! Duh! Show me the metal!!" Well before I wax poetic about actually doing silver airplanes in SILVER, have another look at the F-51 Mustang above. 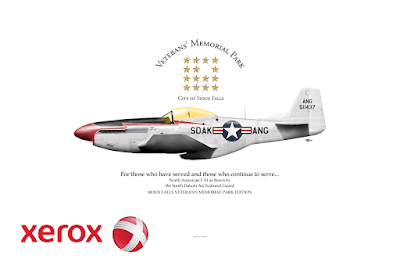 This particular Mustang was actually commissioned by the fundraising arm of the Veteran's Memorial Park (VMP) of Sioux Falls, South Dakota. 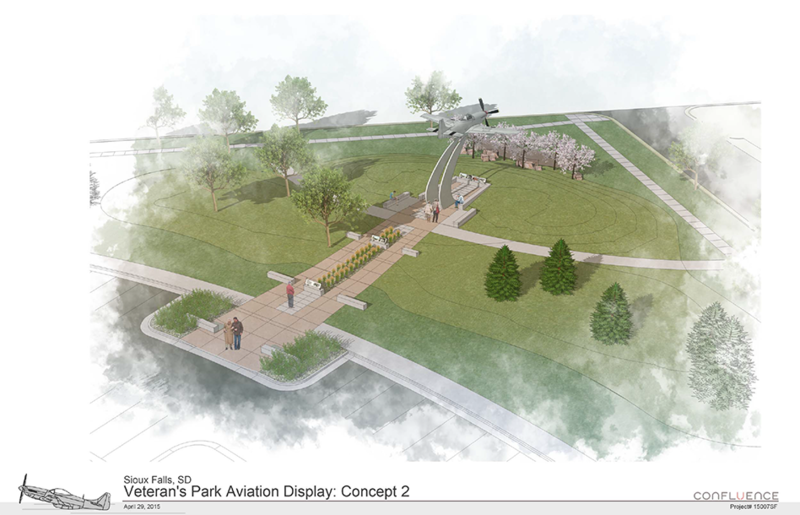 It's a representation of the first aircraft flown by the South Dakota Air National Guard and a full-size replica will become part of a pretty awesome outdoor memorial. 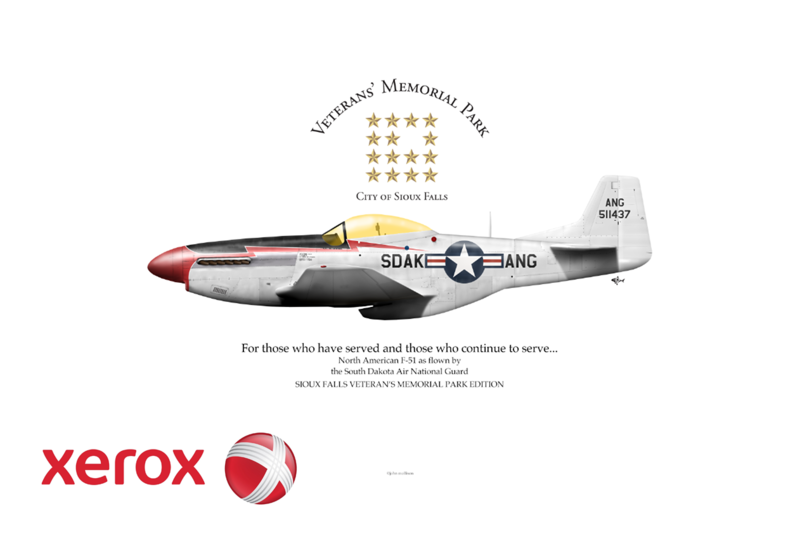 The VMP will offer my artwork, hopefully signed by an SDANG pilot who flew the F-51, to the community as a fundraiser. 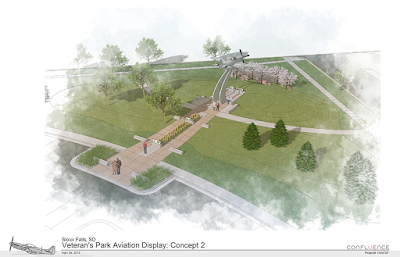 It should be a pretty awesome way for people to recognize the service of the area veterans and also (cough cough) have something cool on the wall. It's probably my best F/P-51 ever. Recently (as in really recently) they printed my F-51 using this new metallic ink process and shipped a box to me. Evidently, they're using it as a tradeshow premium. But for me, I was so gobsmacked by how cool it was to see a silver F-51 actually printed in silver ink that I neglected to keep a single piece for my records. 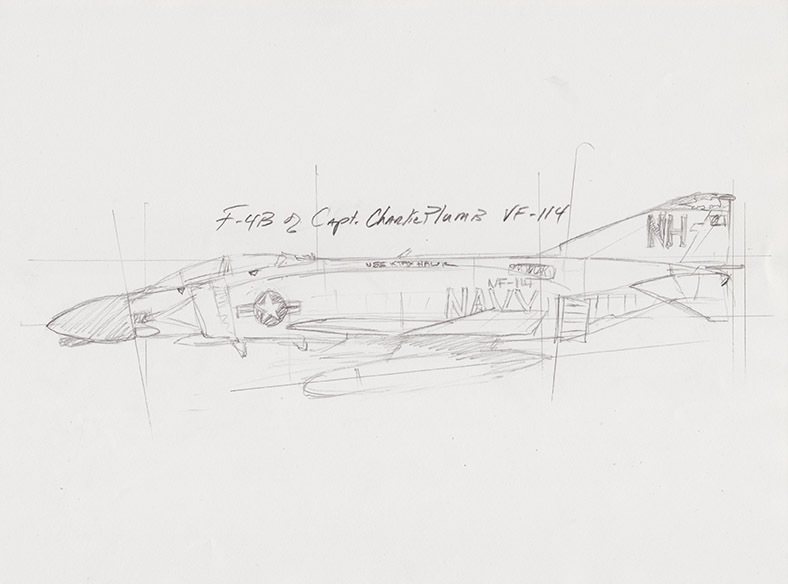 But, the folks at Xerox were kind enough to sponsor our next episode of "Old Guys and Their Airplanes" and actually used their silver ink in a special run of my drawings of Charlie Plumb's F-4B and C-141A. I wish you could reach through the monitor and see the subtle yet very real distinction this touch makes to my art. 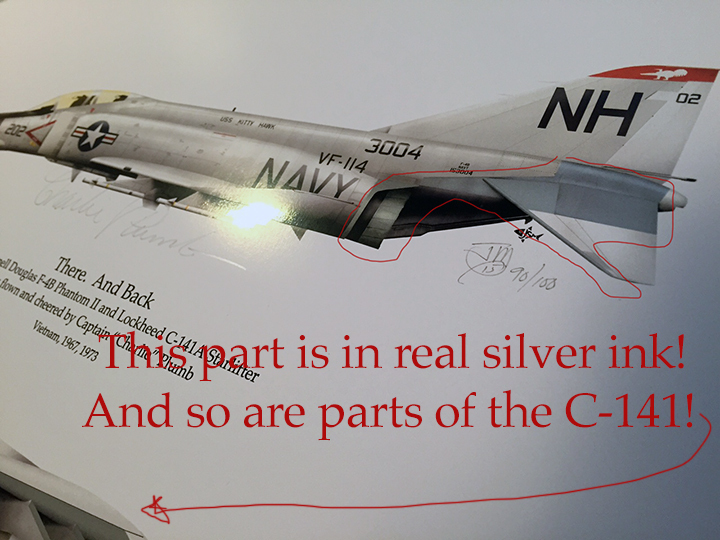 A photo of this special "Silver Edition" of Charlie's F-4B and C-141A is shown above and it doesn't do it justice. 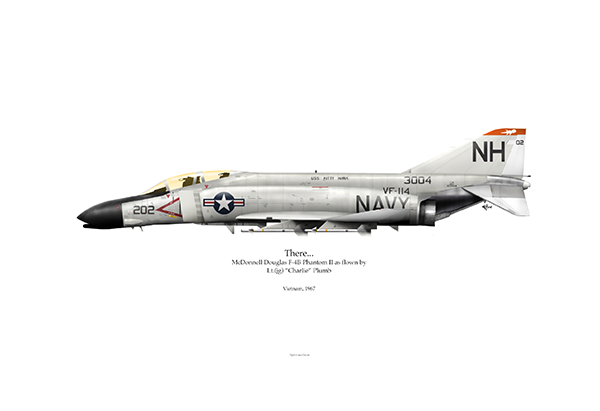 However, if you're interested, you can purchase one of these "Silver Edition" prints on my website by clicking here (proceeds go to the SoCal Wing of the Commemorative Air Force). In the meantime, I am truly grateful for the team at Xerox for their work. And now you know HOW I can do what I do! (Watch the video below to find out what Charlie has been wanting to do for a long time, too). I lean over to cameraman Rick and whisper, "Did'ja ever see the movie, Apocalypse Now?" He grimaces, then softly sings the opening bars to the haunting vocals of Doors song that opened the film, "This is the end. Beautiful friend. This is the end..."
It was no stretch of my imagination to imagine the river bank ahead erupting into shards of splintered trees and metal shrapnel as a Huey Gunship roared overhead. 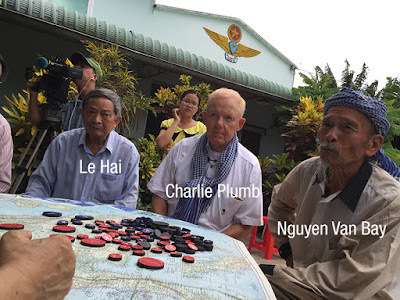 Yet, the reality of the moment was more improbable than the scene playing my head—I was going to a caucus of North Vietnamese fighter pilots with one American fighter pilot, Capt. Charlie Plumb. Charlie's credentials are pretty amazing—author, speaker, Naval academy graduate, 75 combat missions and ex-POW; in his career, he's pretty much seen it all. But the Vietnamese contingent was rather experienced as well—among them were two Generals, a Colonel a successful entrepreneur and a captain of Vietnamese industry. 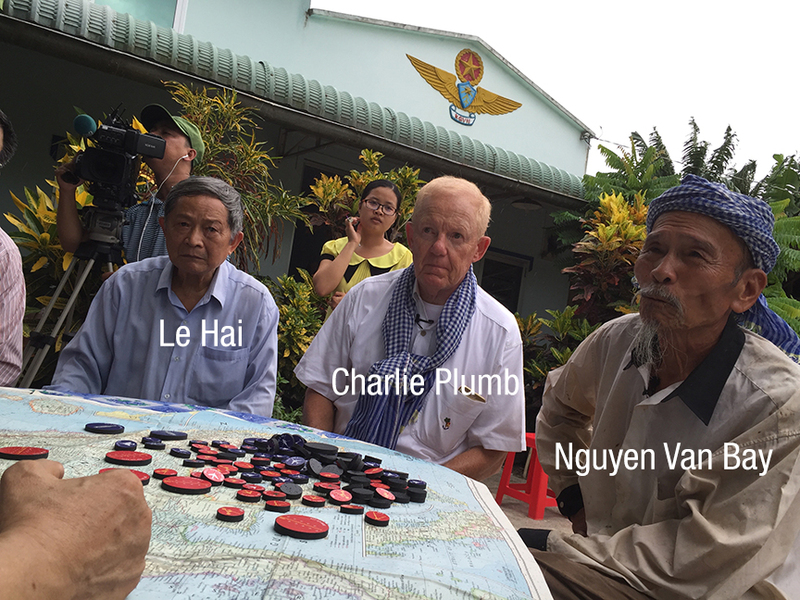 And two also happened to be the Honchos of the MiG-17: Le Hai and Nguyen Van Bay. Between them, they accounted for 13 American airplanes. Hold that thought and have a look at the MiGs below. It was a strange day. Don't get me wrong, I'm not complaining! Our hosts were fantastic, the scenery amazing, food delicious..and yet, the history of the moment was sticky like that plastic wrap referred to in line three. War can do weird things to the brain and if merely studying it can warp my own (a Gen-x'er who's never really had to suffer much for anything) I can't comprehend what it does to those who actually have experienced it. It was, as they said back in the '60s, "...a trip." Anyway, back to the MiGs. Notice the green-black MiG-17? That's Le Hai's. The silver one would be Van Bay's. Of course, the men flew other MiG-17s too—the NVAF didn't have assigned airplanes; they took whichever one was ready when the scramble-call came. But, I can confirm that the "Bort" numbers on the nose are accurate. 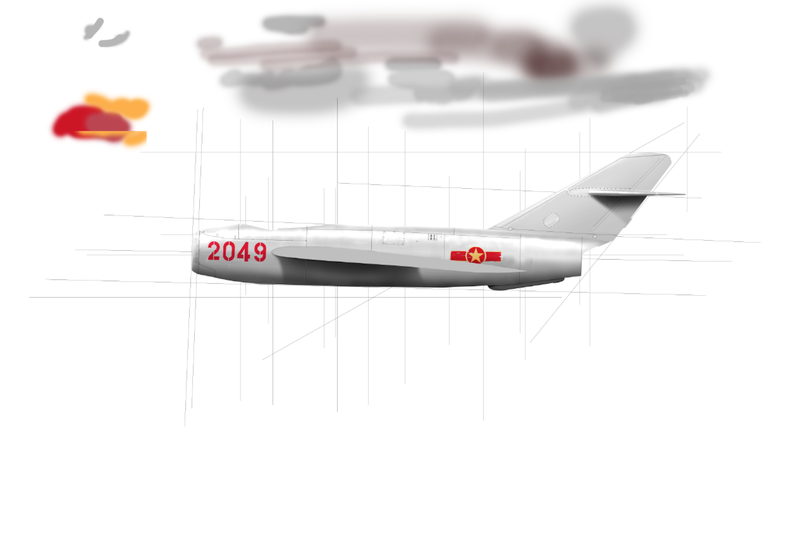 So, to the plastic modelers reading this blog, these are indeed their MiGs. And, they're especially proud of them because these were, during the VN war, technically second-string fighters that gave the #1 military power in the world a nasty bite. It needs to be understood that when the MiG-17 was first-flown back in 1950, it was state-of-the-art in an "art" that was in a state of rapid flux; by 1967, the airplane was out-of-date compared to the much more advanced American iron like the F-4 Phantom or F-8 Crusader. But "out of date" doesn't necessarily mean the pilot was condemned. For a variety of reasons (next post) the North Vietnamese used the MiGs with remarkable effectiveness. It's generally accepted that MiG-17s accounted for 28 aerial kills between 1965 and 1972. In that time span, approximately 65 MiG-17s were lost in combat for a Win:Loss ratio of about 1:2. Granted, those numbers put the North Vietnamese on the short side of things but are actually rather remarkable. Consider this—Le Hai (the green MiG) was credited with six aerial victories. Van Bay (the silver MiG) was credited with 7. 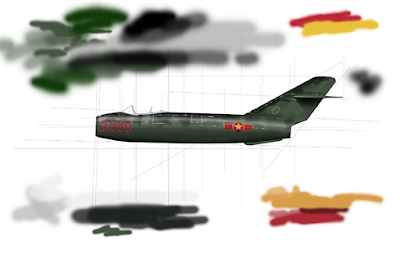 The 13 victories between them account for nearly 50% of the total aerial losses due to MiG-17s during the Vietnam War. REPEAT: Nearly fifty percent! It doesn't matter what side you're on, these are the mounts of two pilots who deserve respect. Now. You might be wondering why on earth Charlie was meeting these two guys. Well, it turns out, he may have met them back on 24 April, 1967 but wasn't able to get a good look at their faces. calibre listening to me is a page out of the Twilight Zone. PS - Why "Snakes"? It was the nickname given to the often snake-colored MiG-17s. 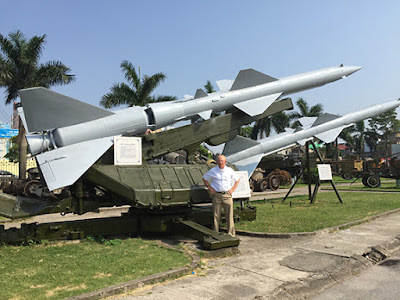 There are two versions of the story; one is that the name was given by the North Vietnamese pilots who saw their aircraft as deadly, quick and maneuverable. Like a snake. The other version is that the name was given by American pilots who saw the MiG-17s as pestilent, nasty and to be dispatched as quickly as possible. Like a snake.